7 o’clock – start in Obertraun. 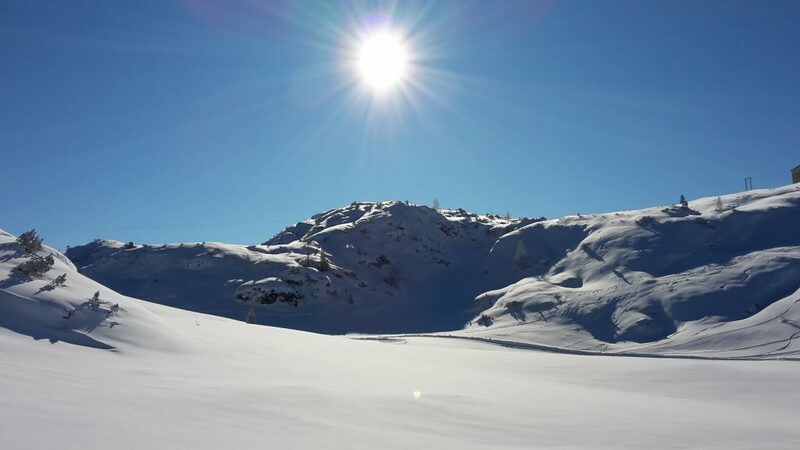 Minus 20 degrees – ok, there is some progress… The tour started in a skiing area. Unfortunately, I had to assert that going up the slope was not allowed. I went on, anyway. 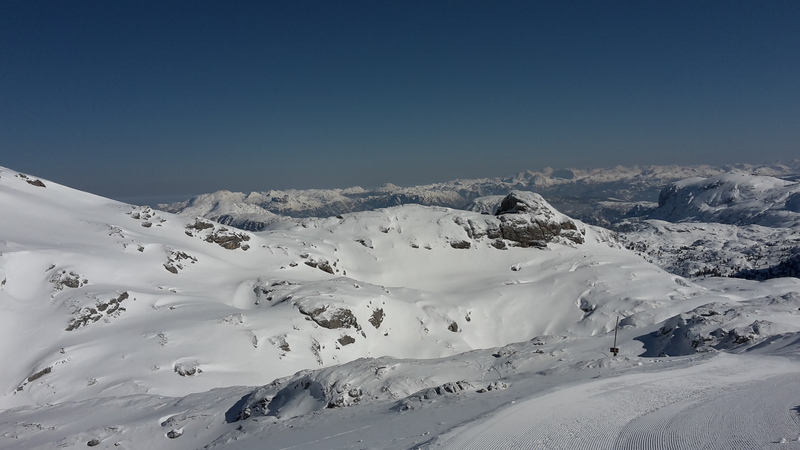 Before the first skiers would appear, I expected to reach the Dachstein plateau and luckily there was no further trouble. Going up the slope is not what I am used to do, but in this case I was happy to gain many meters in altitude in short time. 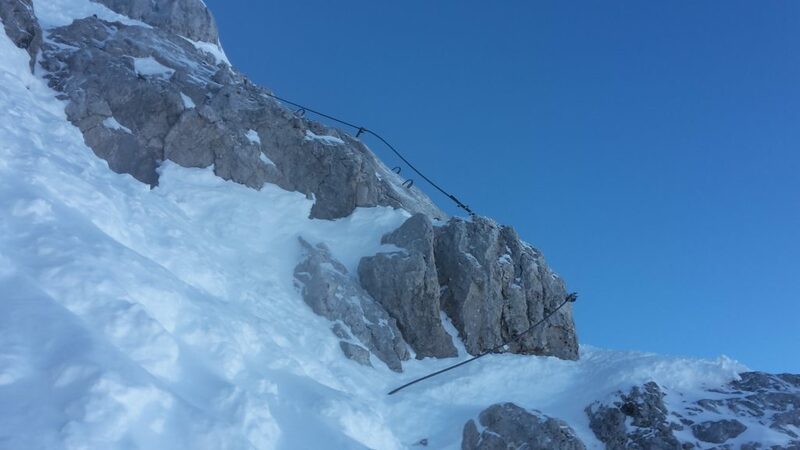 Traversing the flat, cragged Dachstein plateau would cost me enough time anyway. The low temperature was not so bad at all. At least at any place apart from one sink below the top of the Krippenstein – the so called “Eisgrube” (ice pit). I swear it felt like minus 40 degrees or less. Gosh, I have spent stormy hours at peaks of more than 4000 meters in altitude, but can not remember of having felt such a cold before. Impressive, but not too comfortable… Hardly feeling my fingers anymore, putting on all warm clothes, I just rushed on to reach the plateau where the sun was already shining to let everyone forget, that this was the coldest day of this winter. Short time later I passed the Gjaid Alm and happily saw that there was a fully prepared winter way traversing the Dachstein plateau right to the Simony hut. Actually, I really enjoy searching my own way, taking the adventure of orienteering and taking right decisions, but in this case, I still had a long way ahead of me. So this path was very welcome. I progressed to Simony hut in good time, so I could go on for the rest quite relaxed. 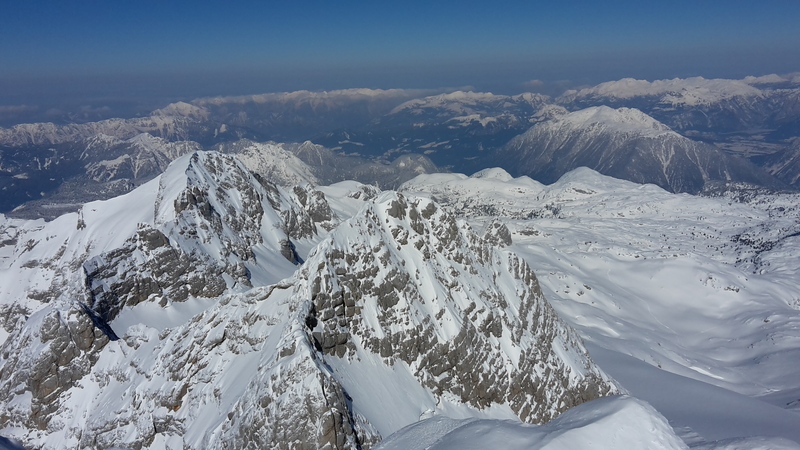 Traversing the Dachstein plateau is quite an adventure. 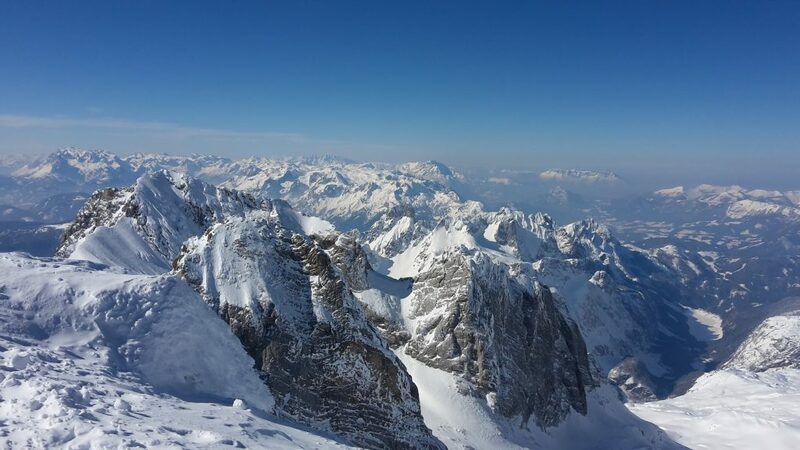 The wild landscape is marvelous, the peak of the Dachstein is always in sight. I really enjoyed crossing the plateau and took my time for taking some picutures. Doing this on a bright sunny day like this was a perfect decision, for sure! 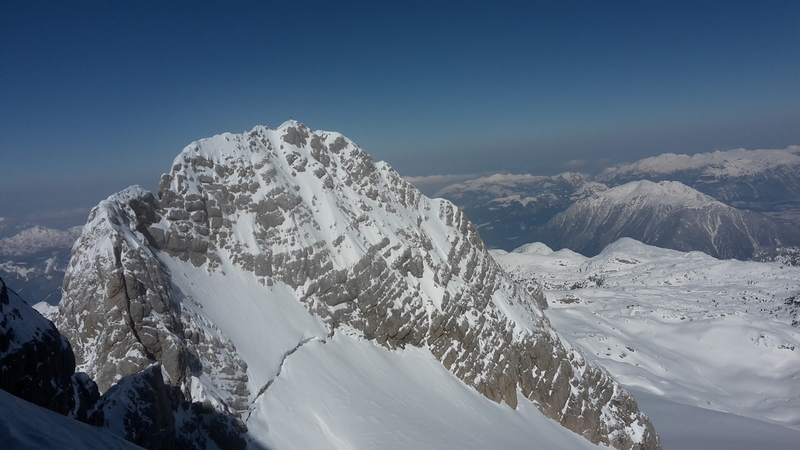 I reached the Simony Hut and went straight on to the Dachstein glacier. Now, it was not far anymore. I went up the small glacier and left my skies at the depot. 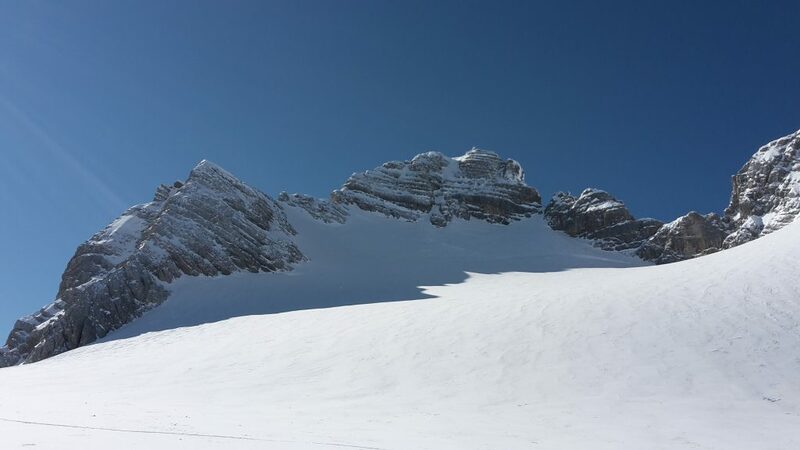 The last 150 meters I had to climb a steep gully where crampons and the ice axe are needed. 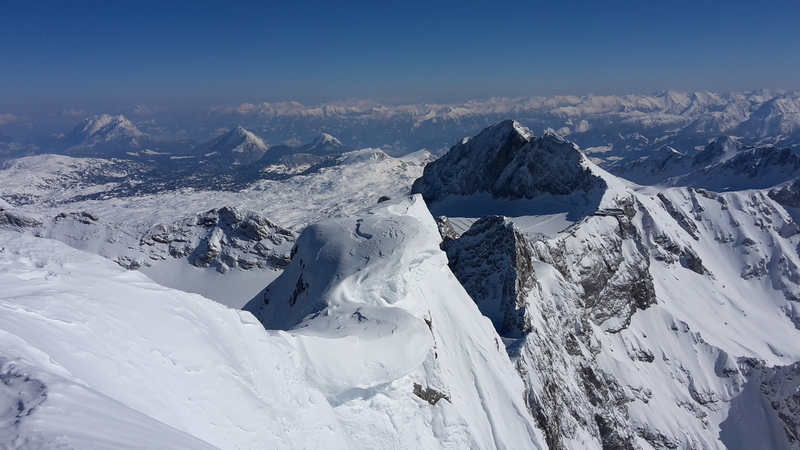 After less than 6 hours of ascent, 2750 meters ascent in total and more than 16 km distance I reached the peak of the Dachstein – the “Top of Styria”. 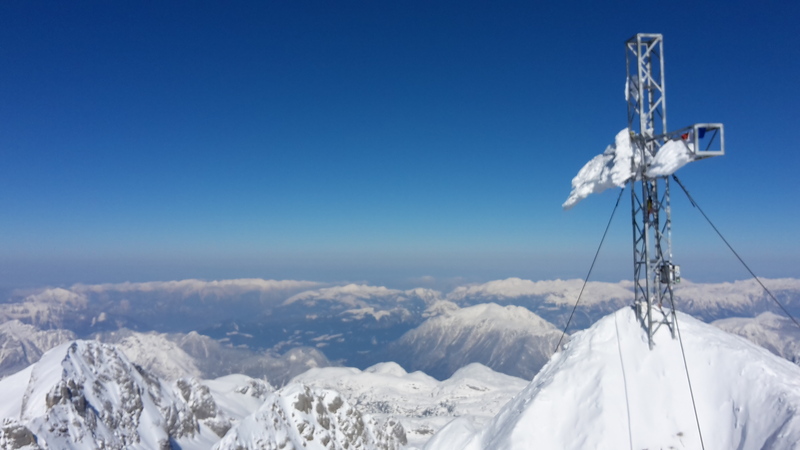 And I was the first one that day :) Climbing the Dachstein in winter time is always a nice adventure and I like it much more than in summer when hundreds of people are climbing up the via ferrata. 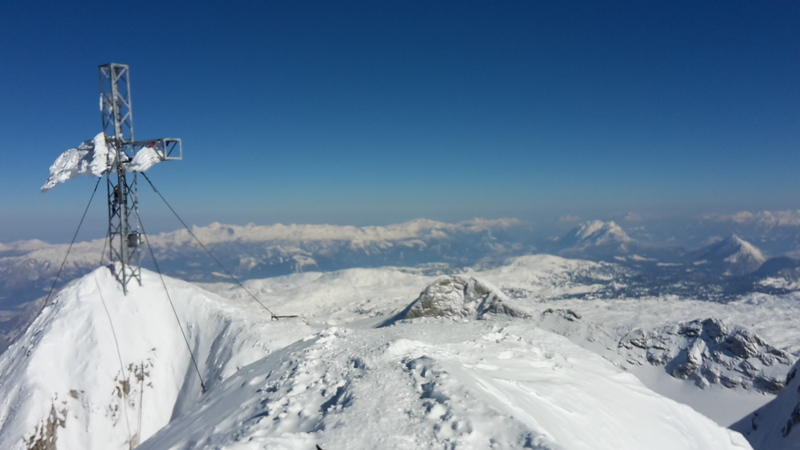 This day I had the summit for me alone. The view is beyond words, looking into the Enns river valley, into the Tauern and into the northern parts of Austria. No wind, just lots of sunshine. What a perfect day! 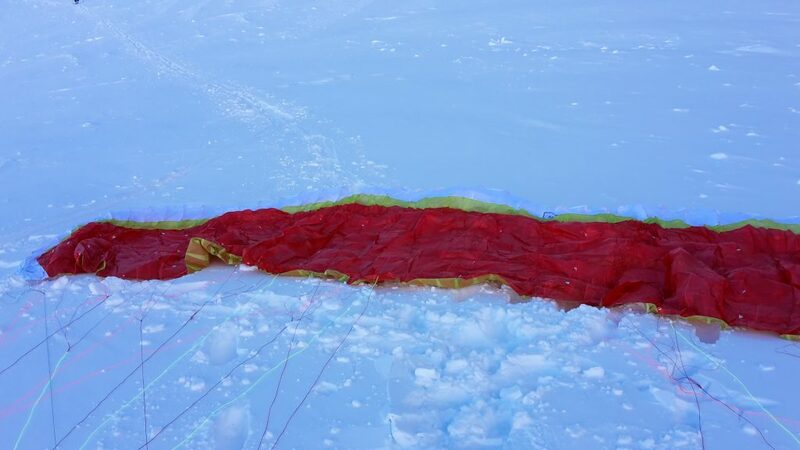 I went back to the depot and prepared my glider – my brandnew MENTOR 5 Light – for take off at the upper part of the glacier. The launch was quite easy an so I started my flight over the plateau. Unfortunately, my GoPro Camera decided that it was too cold tonwork. So, no video, only the pics in my head. 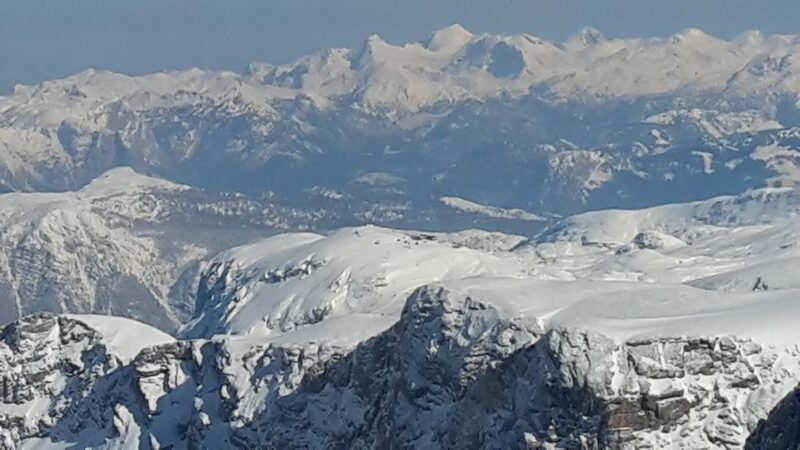 Having a look at the fascinating Dachstein plateau from a bird’s eye view was a breathtaking experience. Despite the f*** freezing cold this was one of my most unforgettable flights. Because of head wind right after take-off and the long distance across the plateau I could not make it entirely. 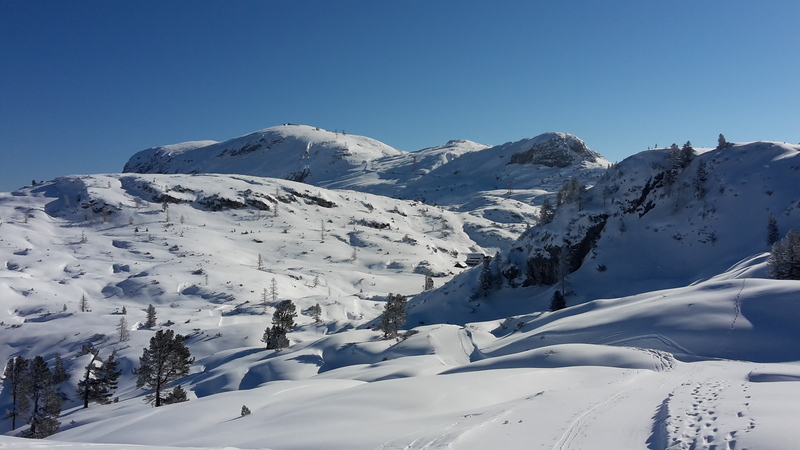 I landed right next to Gjaid Alm (prepared winter trails are perfect for landing with skis). And this was not so bad at all. 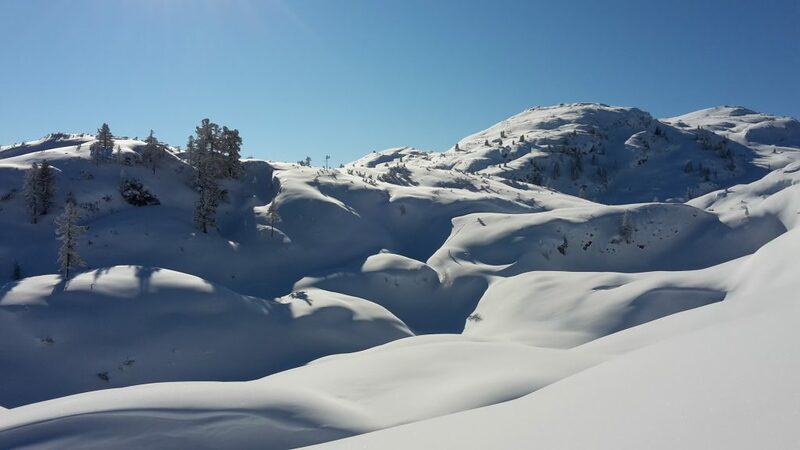 If I would not have frozen to an icicle during the long flight down to Obertraun, for sure I would have done so while packing my glider in the cold shadow down in the valley. 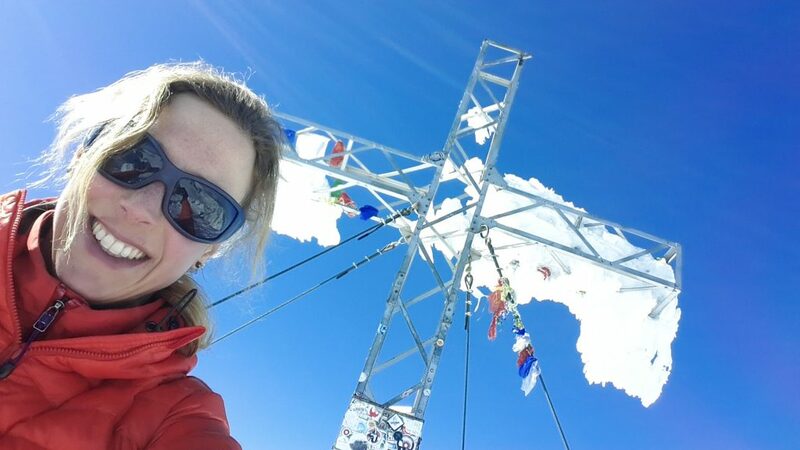 I packed the MENTOR relaxedly in the warming sunshine and enjoyed some more sunshine and a fine “Topfenstrudel” at the sun-terrace of the Gjaid Alm before skiing down the ski slope back to my car. An impulsive decision, a fine sunny day, a great adventure, an unforgettable flight and for me personally a respectable achievement! 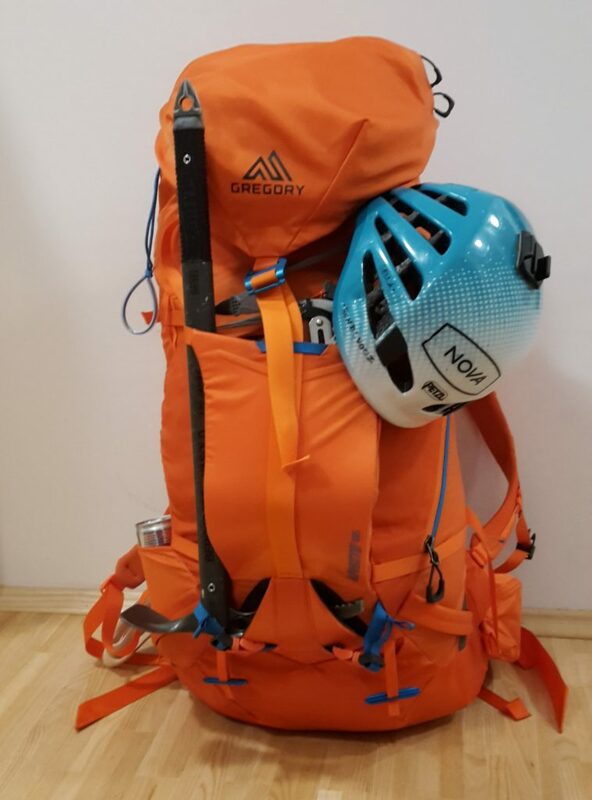 The only pic of my glider this day ..
My new Gregory Alpinisto – and yes, my Mentor 5 Light incl. harness and all the other stuff is in there! You are an animal, Tamy! Respect.